To say I love coffee is like saying that Taylor Swift likes to sing about boys. Coffee brings me joy. It picks me up when I’m feeling low. It calms me down when I’m spazzin’ about real life. It motivates me to get shiz done when all I wanna do is watch Law & Order (SVU, for the record. That Officer Stabler really knows how to fill out a button-down shirt). Coffee takes bad days and makes them good. It takes good days and makes them better. Probably the only thing I love more than coffee (other than, you know, friends and family and other yucky love stuff like that) is watching Lifetime Original Movies with my friend Matt while simultaneously doing a unicorn puzzle with his wife/my friend Chelsea. Detailed, I know. But you asked. And when you love something, you want to know everything there is to know about it. Coffee is something that’s easy to be passionate about: It literally has the power to improve lives at every socio-economic level (from fair-trade prices for third-world farmers to a sustainable, popular product used in charity fundraising) and it’s something that is both fascinatingly accessible and aspirational. It’s long been a goal of mine to travel to different coffee farms around the world and learn more about the journey from farm to cup, and I became a barista a few years ago simply for the sole purpose of getting to work with coffee first-hand and share that love with others. For years now, I’ve been getting my grubby paws on every great coffee-related article, book, video, and documentary I could find, and I quiz coffeeshop owners and baristas the way an aspiring filmmaker haunts movies set…I just wanna to learn! Teach me everything you know! I promise I won’t bother you, just let me stand here in the background and watch! So when the good people at Backroads Coffee & Tea invited Meg and I out to check out their new expanded roastery, it was on par with the time when I first realized that Google could be used to gather background information on all the guys I had crushes on. Backroads Coffee & Tea is the kind of locally and family-owned business that most of us like to think of as our favorite little secret…even though Backroads is definitely no longer little. Some fun facts: In 2000, Backroads built a new roasting facility to keep up with the demand of both their retail and wholesale coffee sales. In late 2004, Backroads moved from their original location on Dakota and 2nd (the building that now houses the Hayward Fly Fishing Co.) to a larger building a few spots down Dakota Avenue. Last year, growing pains hit Backroads once again, and they’ve been busy remodeling the original roastery building (located on Hwy 77, about 20 minutes outside Hayward) and building an addition to expand the overall space. This past fall, they also added a new retail location on the Main Street of Hayward, which sports a different name – Hayward Coffee Co. – and arguably, a different style and sensibility from the original flagship store (the two shops are so different in appearance and menu offerings that most visitors – even locals – don’t know that they are owned by the same company). To put it simply, what began as a small retail shop that roasted its mail-order selection of coffees on site has grown into a full-fledged coffee empire. Backroads fans are legion. Whether it’s the local regulars who show up every morning for their daily caffeine fix, the far-flung mail-order customers who were won over with a single visit during Birkie or Fat Tire, or the businesses and restaurants who exclusively depend on Backroads for their own private label blends, Backroads has a wide and varying base of consumers. (Okay, so I was looking at Meg like that. I read a lot of historical fiction when I was younger that still happens to inform my imagination today). After entering the building, we were greeted by Teresa, the CEO/President of Backroads. After introducing us around to the staff, Teresa then led us through some of the day-to-day operations of the roastery. Basically, the demand for freshly-roasted Backroads coffee is somewhat staggering. Backroads roasts nearly 200 varieties of specialty-grade coffees, from their signature blends, dark roasts, organic and fair trade, single origin, flavored and decaf coffees. They continue to expand into retail locations like grocery stores and other coffee shops, as well as continuing to provide coffee for many local restaurants and resorts. Another growing division of the roastery is the private label division, where brands and businesses can sell Backroads coffee under their own branded label for retail. For both wholesale and private label clients, they offer custom roasts and will profile match a coffee specifically to fit that client’s vision (and yes, after learning this, I’ve totally been dreaming about how to produce and market my very own custom blend and brand of coffee…maybe a Girl from the Northwoods blend, something light and lively? Or perhaps a Dapper Dozen blend…dark, strong and spicy? The possibilities are ENDLESS!). They also do a fundraising program, a super sweet set-up where eager beavers can sell Backroads coffee to their friends and family to help raise money for their school, church, or extracurricular organizations. And of course, whenever visitors to Hayward come to Backroads and try a new favorite brew, invariably Backroads’ mail-order customer base expands. With the fast-paced growth of all these different branches of the business and the new expansion of the roastery itself, it only made sense that there be a newly expanded identity, as well. On January 1st, 2014, Backroads Coffee & Tea unveiled the new name Midwest Roasters to their staff and wholesale customers. While the name reflects the new growth of the overall business, it won’t impact either Hayward Coffee Co or Backroads Coffee & Tea retail shops, nor will it change the signature style and thoughtful marketing that so many have come to recognize and love. Having an umbrella name for the roastery simply ties all of the divisions of the business neatly together, and provides room for even more growth. But back to the coffee paradise that is the roasting facility: Teresa introduced Meg and I to her husband, Rod, The Roastmaster, and Nick, who helps man the two Royal roasters at the facility. This Is, of course, Where The Magic Happens*. 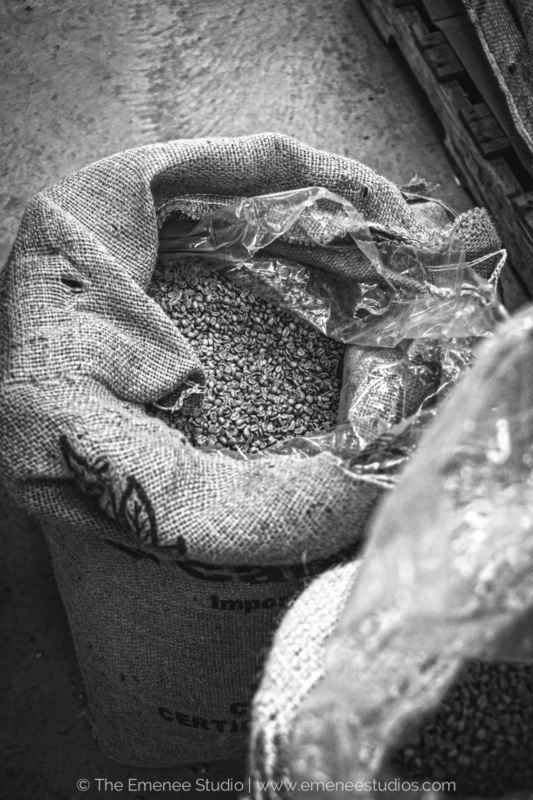 The process of green coffee bean to roasted coffee is both simple and complex. First of all, a bit of basic knowledge is needed: Coffee is a dense, oil-filled seed (it’s technically a seed, though commonly referred to as a bean) from the fruit of a flowering tree. The process of how that seed is grown is what identifies it as shade-grown (the traditional method of growing the plants under a canopy of trees, as opposed to the self- explanatory sun-grown), bird-friendly (often the same as shade-grown, a method which preserves wildlife habitat in origin countries, as opposed to sun-grown, which, depending on country of origin, requires rainforest land to be cleared for the coffee crop), organic (pesticides are not used on the plant or seed), etc. And, like wine, the character of coffee is influenced by the terroir of its homeland…for instance, Costa Rican coffee tastes rather different than coffee grown in Ethiopia or the Congo. Midwest Roasters (did you notice that we started using the new name as soon as we spilled the beans on it? Yeah, we’re pretty comfortable with change. Also with puns) buys their coffee beans from many different countries of origin. Because they’re still a small company and their day-to-day operations are dependent on Teresa and Rod being present, taking the time out to visit different coffee farms is a feat for the future. Thus, they rely on expert coffee brokers, a standard practice for the coffee industry. Coffee brokers are the go-between between coffee supply and demand. They make it their business to know coffee better than anyone else, and they do this by spending much of their year visiting various coffee farms and cupping (more on that later) different coffee sources in order to investigate the origin and grade of each coffee supply. Through this, they are better able to develop satisfying relationships with clients like Midwest Roasters. The first step of roasting is measuring out a batch of raw beans (in pounds) and pouring them into the already heated-up (we’re gonna use layman’s terms here, kay?) roaster. 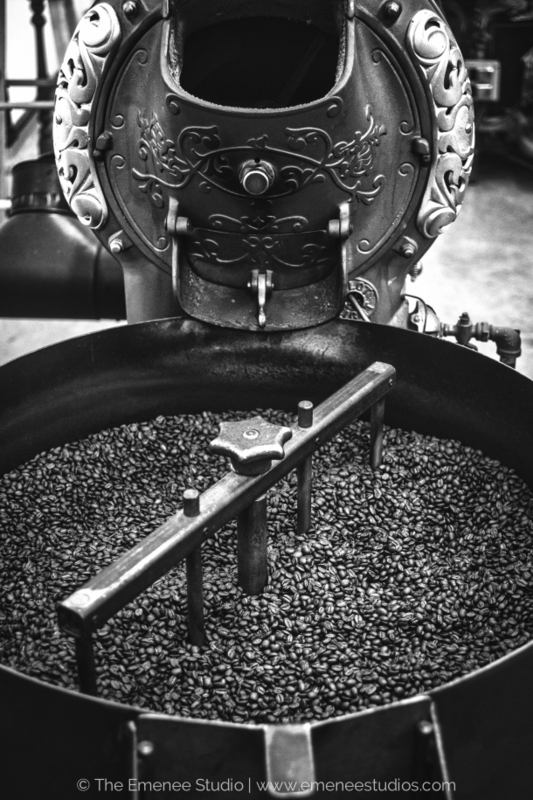 Depending on your roaster, the first 10-12 minutes is both the longest and easiest part of the roasting process. This is the part where you’re letting the roaster do all the work in taking the raw beans to a point where they’re fit for consumption (otherwise known as going from “green to yellow”). After about 10-12 minutes, the beans reach what’s called “first crack” (an audible popping sound of the bean). The coffee bean grows larger from the heat and the skin of the bean turns darker, and the wrinkle on the bean begins to stand out as a whitish or pale beige color. Roasting right before or right at first crack produces a light roast, a bright and slightly acidic flavor or coffee (also, fun fact: The lighter the roast, the more caffeine. Most of you probably know this already. I totally did not, had always assumed the opposite). From the first crack, you’ll reach each different variation of roast in about 30 second increments. The next stages of roasting are your city roast, then your full-city roast, a more lively and full-bodied flavor: the beans are a bit larger and darker, and the wrinkle of the bean is a pale gold. Keep roasting and you’ll come to the second crack, where the beans puff up around the wrinkle. Roasting right to the middle of the second crack are your medium-dark coffees, where the flavor grows a bit darker and spicier, like in the Vienna roast. After and beyond the second crack is the dark roast territory – where more chocolate, smokey flavors begin to come out of the bean – and this where things get tricky. Go to the end or a bit beyond the second crack, where the oil of the beans starts to draw to the surface, and you’ll reach a beautiful, strong French Roast…but get lazy or distracted at this stage and you risk burning the beans, resulting in awful coffee and a load of carbon that makes starting a fire in the roaster a firm possibility. In short, French Roast is the scary roast. “So basically you’re trusting me to not start your building on fire,” I said, as he handed me the coffee scoop. Being a first-timer and a bit gun-shy that I would let them go too long, I pulled a scoop of beans from the roaster every 15 seconds to check them for color and cracking. Finally, after about 5 pulls, I pulled a scoop to see a slight sheen on the bean. “I think they’re ready!” I said excitedly (read: anxiously) to Rod. He agreed, and showed me which latch to pull so the beans would spill out of the hot roaster and into the pan to cool. Watching the beans pour forth, I said a little prayer of thanks to The Beyonce In The Sky and then congratulated myself on roasting my very first batch of French Roast and not starting a fire while doing so. After the roasting – and depending on what type of roast it is – newly-roasted coffee at Midwest Roasters is then either packaged and shipped to their wholesale customers, brought over to the flavor station for flavoring, or packed and labeled and walked over to Mary, who expertly takes care of mail-orders and shipping. For the last leg of our tour, Teresa and Rod led us into the staff room for a cupping. A cupping is the professional practice of observing the tastes and aromas of brewed coffee. It’s most often performed by coffee graders and brokers to judge the quality of certain coffee before it’s imported to buyers, and it’s also done by owners and roasters like Rod and Teresa to judge the character of their roasts and blends. Cuppings have also become popular events held by coffeehouses and roasteries to teach customers more about their coffee. A standard coffee cupping procedure involves taking a spoon to a “cup” of coffee (coffee grounds with boiling water poured over it, which creates a “crust” that you then break with the spoon), deeply sniffing the coffee, and then slurping it so it spreads to the back of the tongue. By doing this, you attempt to measure aspects of the coffee’s taste, specifically the body, the sweetness, the acidity, and the aftertaste. Expert tasters (also known as Master Tasters. And yes, there’s a ton of jokes in there that I could make, but we’ll move on for the sake of brevity) will also attempt to identify the coffee’s origin from the telltale flavors of the region where it might have been grown. First, you break the seal of the “crust” with a spoon and waft the aroma toward your nose with the spoon. You feel a bit like a pretentious jerk when you do this, but for a coffee lover, there are few experiences that rival that first scent of a cupping. Then, after recording your interpretation of the coffee’s scent notes, it’s time to slurp that stuff into your mouth and let your tongue go to work. “And you don’t want to swallow it right away?” Meg asked. “The caffeine in that little cup would have you buzzing all day long,” Teresa noted. So, to summarize: Slurp the coffee as hard and as loud as you can, but not so hard that you end up swallowing it, then let the coffee sit around in your mouth while you try to categorize all of the intricate flavors, and then spit it out. Yeah. Maybe don’t go to a cupping while on a first date, nor do it with someone you care terribly about impressing. Looking at each other, spoons poised just above the cups, Meg and I caught eyes. “Lumberjack,” I whispered to her. Solemnly, she nodded. Bending down, we dipped our spoons into the cups and let the black liquid gold rush onto the spoon. Then, together, we lifted our spoons to our lips and SLLLLUUUUUURRRRPPPPPPPPEEEDDD. “Do it a little faster,” Rod told us. Luckily for us, no money was resting on our tastes. “Could you tell some differences in those coffees?” Teresa asked. We discussed how one of the coffees tasted like the lightest of the three, but was also the most bitter and least favorite for both Meg and I. I really liked the darkest flavor – it was most similar to a dark Americano for me, which I drink every day (I like my coffee like I like my men – strong, dark, rich, and with just enough bitterness to make things interesting) – while Meg picked the third one, a medium body with a bit more sweetness to it – as her favorite. PLEASE MEET YOUR NEW TASTE MASTERS, EVERYBODY. MY NAME’S AMBER, AND THIS HERE IS MEG. Before we left, Teresa and Rod gifted us with our very own batch of coffee, roasted by yours truly (!!). Pretty much the best takeaway ever. It’s not often that taking a tour of a business facility turns into a day you’ll never forget, and we’ve all heard the expression about how sometimes it’s best not to see how the sausage is made. We knew from the moment Teresa asked us to visit that we would have a great time learning more about the roastery, but we had no idea just how much of a blast we’d have, or how educational it’d be to our humble day-to-day coffee drinking lives. Getting the behind-the-scenes look at Midwest Roasters leaves one with the solid impression that it’s simply good people making great coffee. Rod and Teresa’s love for great coffee and the fun they and their staff have making and producing it for others is both refreshing and inspiring. As we wrote earlier, their fans are legion…and with the growth and expansion of the roastery and the business, it’s no question that number will also expand, as well. * Tipsy Trivia FTW: Name the MTV show where that phrase was made famous by every single celebrity who was ever featured on that show, all of whom thought they were being hilarious and original when they said it upon entering the master bedroom. ** Okay, I’ll just tell you: It was MTV Cribs!